Braamfontein Alive: Medical Jokes:Pure Genius. One of the richest and most powerful men in Brazil, Thane Chiquinho Scarpa, made waves when he announced plans to bury his million-dollar Bentley, so he could drive around his afterlife in style. He received lots of media attention, mostly negative and was severely criticized for the extravagant gesture and wasting of a precious commodity. Why wouldn’t he donate the car to charity? How out of touch with reality is this guy? He still went ahead with the ceremony. 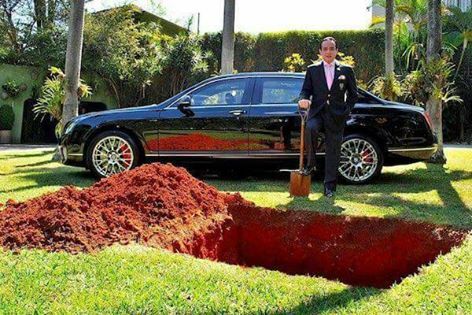 Moments before lowering the car in the ground prepared for the burial of his Bentley,he declared that he wouldn't bury his car and then revealed his genuine motive for the drama: Just to create awareness for organ donation.